In the West, we sometimes make mention of a Man in the Moon, but really it's just something that people say and doesn't carry much resonance. Same thing with the whole idea of 'the moon is made of cheese.' Other than being a comical premise in kids cartoon shows, again, it's not something that carries much cultural weight. 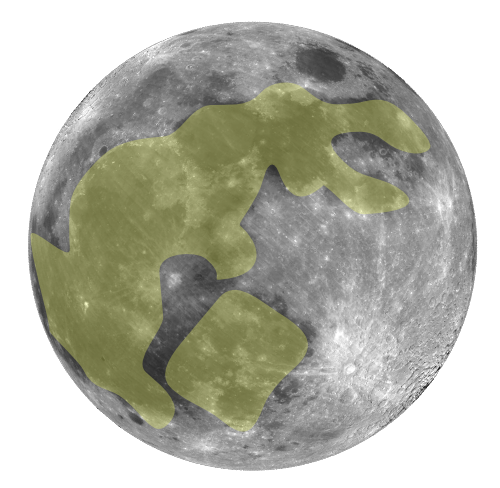 In Japan, Korea and China, it's understood that there's a rabbit in the moon instead. I have no idea to what extent this story has sway over Asian cultures, but I do know that this why Sailor Moon has a cat companion named Luna and has a nickname of Bunny. At the beginning of the month, I like to say 'rabbit rabbit' but evidently this has nothing to do with the rabbit in the moon. And at one time, I meant to make my own moon names, but I never got beyond March, which I renamed, Pothole Moon.